The “new” New Rochelle Diner opened directly across from the Home Depot over a year ago. Getting into the diner parking lot is a bit tricky, when turning around the bend from Main Street towards the Home Depot. The entrance comes up fast so be ready for it. The diner’s interior is popping with bright orange accent colors along with oversized photos of New Rochelle. I loved the retro feel all around the diner, inside and out. I met two friends for breakfast there a few weeks ago. Their breakfast menu provided a wide and diverse selection of interesting items. Coffee is very important to me at breakfast. It has to be good! The coffee was okay, a bit too strong and not flavorful enough. The second cup was better. One friend ordered the pancakes, which she noted were cooked perfect and of generous size. My other friend ordered a fresh mushroom omelet with home fries. The omelet was well done and flavorful, home fries were average, just potatoes without onions or peppers. I ordered the waffle. It was cooked to my taste, crispy on the outside and soft on the inside. While the diner had real butter, they did not have real maple syrup. (Most diners will have the real maple syrup for an extra fee.) Frequent refills of coffee were offered, and Angel our waiter was very attentive and friendly. The ladies rest room was spotless and very eye appealing, really done up right. In my book, if the rest room is really clean, I assume the kitchen is as well. Our bill came to $30.39 for three people, very reasonable. Don’t wait for the next time you are going to Costco or Home Depot to visit the New Rochelle Diner. Make the New Rochelle Diner your place to go all the time! Where do you go to breakfast? Please share the name and town of your favorite breakfast spot in the comment section. I live in New Rochelle and I read my local New Rochelle paper, The City Review faithfully. I want to know what is happening in my hometown. In the summer there was an article in The City Review written about a new diner and coffee shop that opened. The picture of the owners, Taso, Helen and Spiros Michialis, struck me as nice friendly people. As I read the article, I paid attention to the fact that they are open seven days a week early in the morning, and serve breakfast. We all know, Mela and I love to meet for breakfast. We now had a new place to check out. On a recent Thursday morning, Mela and I pulled right into a parking spot in front of the Rochelle Coffee Shop inside the Quaker Ridge Shopping Center, located right near the Post Office. Immediately upon entering the coffee shop, we noticed its cozy, retro diner décor. Almost all of the stools at the counter were taken with what seemed to be regular customers, who were relaxed and chatting away. Mela and I took a seat at one of the many booths. We were off to a great start with the coffee, which was tasty and smooth. Later on I asked Helen about the coffee and she told us that her husband and she herself tasted a lot of coffees before deciding on which one to serve. After all coffee is part of their name, so it better be good and it was. The breakfast menu had a large selection to choose from. Mela and I chose a waffle and a spinach mozzarella egg white omelet with home fries and 7 grain toast to share. Everything was delicious. But in our haste to enjoy breakfast, I forgot to take a photo of the dishes. 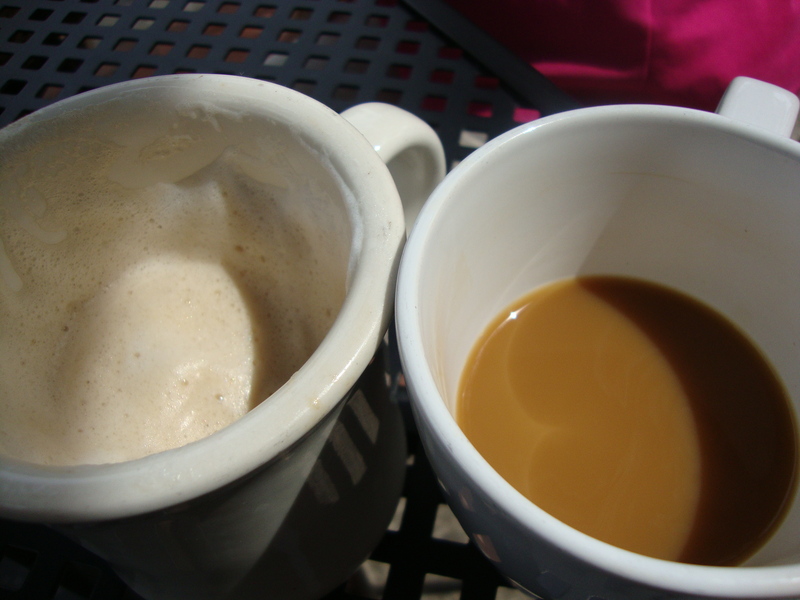 My second trip to the Rochelle Coffee Shop was with my friend, Vivian. We shared the Challah French Toast and a western omelet with home fries and 7 grain toast. Truthfully, the coffee tasted even better the second time around if that is even possible. Everything was cooked to our liking. You just have to ask and your home fries can be made crispier. There is real butter pats but no real maple syrup. Surprisingly the syrup they do use is not too sweet, as some commercial syrups can be. Since my first visit to Rochelle Coffee Shop, it has become my go to place. Helen is always friendly, gracious and easy to talk to, which makes it an extra special treat to patron there. Mela and my breakfast was $13.80, without tip, which I feel is very reasonable. Apparently, there is a special starting at 6:00 am and ending before 11:00 am breakfast Mondays through Fridays. The sign, “Friends Gather Here”, hanging on the wall of Rochelle Coffee Shop, really is the place to go to for this new friend! the other 4 ounces of Cheddar cheese over the top of the potatoes. 3. Bake 1 to 1 1/2 hours or untl bubbly and browned. Serves 10 to 12. 4. ENJOY – Great for Brunch or Lunch! A new tradition was established for my family when my daughter, Marisa, married and moved to Buffalo four years ago. Easter weekend would be celebrated at her home, packed with family, cats, dogs, and a lotta love! In addition, we also get to enjoy her mother-in-law Linda’s special Easter brunch over at her home. Every year our crew is late and the last to arrive. This year we were early and the first to arrive! We think Linda fooled us by telling us to be there an hour earlier than usual; it worked. As all our hungry eyes checked out the buffet brunch, we spotted something amiss: no sign of Linda’s famous, to-die-for Cheesy Potatoes. Panic began to set in and Mia, my daughter, whispered to me, “Where are the Cheesy Potatoes?” Not one to hold back, the words escaped from my lips “Linda, did you make your Cheesy Potatoes?” To our delight and relief, she had, in fact, made two pans. I swear there was a bit of a stampede towards those Cheesy Potatoes. I managed to squeeze in a picture of them before they disappeared – sorry your eyes were closed Linda! Linda gave me the recipe, which I tweaked a little as I always like to do with recipes. A few nights ago, I had company for dinner, and my slightly revised version of the recipe is listed below. All I know is when I offered to give my friends some Cheesy Potatoes to take home, they were thrilled, but my husband was a bit freaked out until he realized there was plenty left over for him to enjoy again. Cheesy Potatoes are great for holidays or any day, especially when entertaining your extended family. Thanks Linda, we appreciate you and your Cheesy Potatoes! 1. In a mixing bowl combine flour, sugar, salt, baking powder, and baking soda. 2. Beat eggs in a separate bowl. Then add buttermilk and eggs to dry ingredients. margarine. Batter will be lumpy. until bottom is browned. Serve immediately with butter and real maple syrup. Makes about 20 silver dollar pancakes. 5. ENJOY – Dollar Pancakes that taste like a million! You know the saying, the way to a man’s heart is through his stomach? Well, I am the first to admit that this declaration really rings true for my sons and grandsons too! My grandsons, Jared and Tommy, are at the age were they are hungry all the time. Time does fly; Jared’s now a teenager and Tommy’s in elementary school. Gramma is never too tired to cook for her grandsons. I’m feeling the love unlike any other love when I cook up plates of my buttermilk pancakes or waffles with a side of bacon or sausages for the boys. When I follow this up by tossing some cinnamon rolls in the oven, it really is the icing on this cake! The brotherly competition between them to see who can eat the most pancakes or waffles just melts my heart. Their younger sister, Mackenzie, gets full after eating one pancake or waffle and then exits the kitchen to do better things — like playing. From experience, having a son and two daughters, I know how the boys eat compared to the girls. My son, Tom, aka TJ, was always hungry, constantly circling the kitchen like a shark after its prey. Having two younger sisters, this worked to his advantage. Sitting next to his younger sister, he would distract her so she’d look away and then he’d casually dip his fork into her plate. Maybe I got a clue that boys eat differently than girls when I awoke at 2 am one morning to find my son eating a large bowl of cereal from a box he’d taken and hidden from his sisters. He claimed to be starving. He wasn’t lying; he was always starving! Boys can’t help themselves, they are bottomless pits. I think it goes all the way down to their toes, giving them those large sneakers to fill. I think it’s my happy mission in life to fill those empty stomachs. A person like me who loves to cook needs a person who loves to eat. So, thank you boys for being hungry, it warms my heart to cook for you.